The magic of jazz comes mainly from the fact that it’s fundamentally built around improvisation. Reinventing the same tunes over and over again is a core part of the culture among the jazz musicians. This is maybe why I find it so cool to track all the ways by which certain tunes have been performed at different gigs in various moments of jazz’s history. I talked about my favourite performance of the classic So What in a previous post. Now I’d like to talk a bit about my favourite Tutu. Tutu was composed by the genius Marcus Miller in 1986. It was originally recorded as part of a Miles Davis’ album with same name that was all composed, arranged, and co-produced by Miller. What I find special about Tutu (the tune) is that it shares a lot of the qualities of So What by working as a sort of minimalist platform for great improvisation. The core foundation of Tutu comes from the 3-note bass line with a chord progression that provides the perfect ground for intense solos. My favourite performance of Tutu is in an album called Dreyfus Night in Paris recorded in 1994, three years after Miles’ death. So, what makes this specific performance so cool? 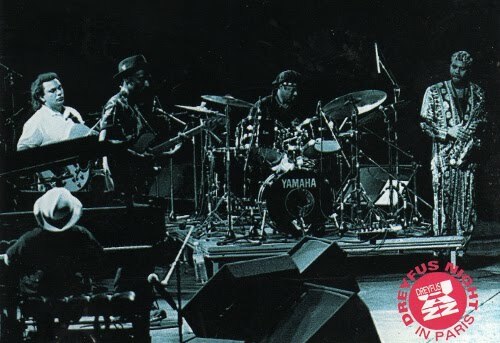 The personnel is fantastic: Marcus Miller (bass), Michel Petrucciani (piano), Kenny Garrett (sax), Bireli Lagrene (guitar), and Lenny White (drums). White and Garret have played with Miles and other giants, Lagrene has a very interesting work with Pastorius, and Petrucciani is just legendary. If you haven’t heard of some of those guys, you should definitely go look for them. You won’t be disappointed! The solos are fantastic! All of them start setting a quiet atmosphere, with sparse notes and rhythm then go into more complex rhythmic and melodic explorations until reaching a climax with high-pitched notes full of energy. Garret’s dissonant arpeggios are overwhelmingly cool. Lagrene brings in a highly melodic solo full of tempo-bending riffs. Petrucciani has such a Hancockian precision in his solo that it almost feels like he’s composing a new tune while improving. Finally, Miller turns his bass into a percussion instrument while still playing the bass line.